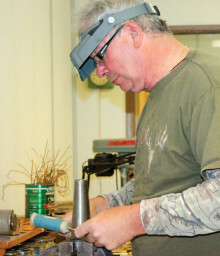 For more than 40 years, Olson Silver Company in High River, Alta., has been a mainstay of silversmithing through western Canada, and a new family plan will see the business through the next generation?—?and perhaps beyond. It’s a plan that will bring Olson’s golden moments for the future. 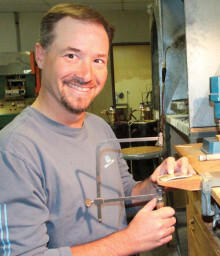 Butch (Rod) Hitchner working on a new custom buckle at his workbench. Photo courtesy Olson Silver Company. Silversmithing isn’t a common art, but it’s a huge and ongoing part of the Olson family history. His father Jim bought Frank Phillips’ silversmithing business in 1968 in Calgary, Alta., and moved the newly re-christened Olson Silver Company south to High River a year later. A decade later in 1978, Butch and his sister Denise Fraser bought their father out. Butch in turn bought out Denise when she retired in 2005, and then sold the business last year to his stepson, Greg Hitchner and business partner Richard Brooks. Greg soon decided to buy out his partner and once again, Butch found himself back in the shop. His career as a silversmith has spanned 40 years, developing sterling silver and gold jewellery. “For most people that’s a fairly long career,” Butch says. The sale to Greg was part of Butch’s secession plan, and took place over a period of five years. The revised retirement plan wasn’t a big sacrifice. Butch had been spending a lot of time in Phoenix, and was able to spend more time team roping, but he knows that retirement isn’t really something that will sit well with him. Greg Hitchner at his workbench with an array of buckles on the go. Photo courtesy Olson Silver Company. New owner Greg also plans on making a life career from the business he knows well; he’d worked in the shop after school when he was a teenager before heading off to University of Lethbridge where he took his business management degree. In 1997 he returned to the family business. Other than a school-time job delivering pizzas, he’s always worked for Olson Silver, and has always loved the work. “Back then, Butch bought me a set of golf clubs, and told me I could come work and pay them off,” Greg recalls with a smile. He was hooked. Butch says he thinks “getting hooked” often happens. People start to learn the art of silversmithing, they get involved with the craft, evolve with it, and it becomes a way of life. “What made me decide to buy it? Butch said I could,” laughs Greg. It’s become a lifetime commitment. Greg still plays golf, so Butch’s deal has worked well, considering more than 20 years has passed since that original deal. As a matter of fact, Greg says he’s a bit of a golf-aholic, and strongly believes that the store will continue at its present location?—?perfectly centralized for the western population throughout southern Alberta. After Denise retired, Greg took over the front end, with the clientele, and the computer graphics side of the work. This gives him good insight on where the trends are heading. For example, tri-colour still remains popular, and Olson’s carries four or five new styles to reflect this. The company has had contracts for the Canadian Professional Rodeo Association, and for the Calgary Stampede Royalty committee, to name just a few. So what are their favourite pieces? 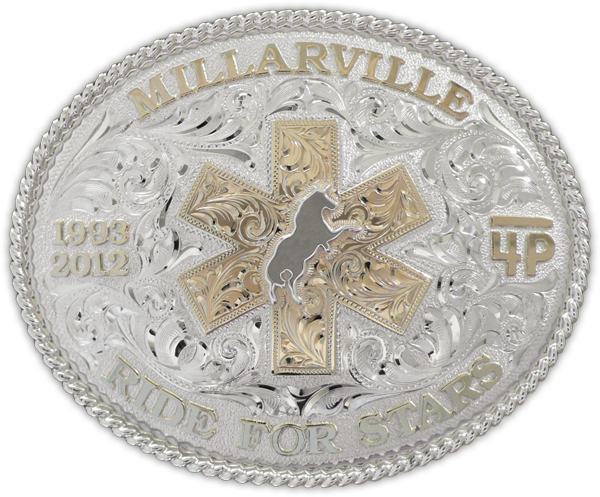 It’s hard to pinpoint one, but one outstanding buckle was custom made for Lara Palmer on behalf of Millarville Ride for Stars in recognition of her 20 years of organizing the event. “It is so nice to make a buckle for such a deserving cause and inspirational person,” adds Greg. Olson buckles has also become popular with the growing movie and television action in the High River area, and has created celebrity buckles for stars such as Jackie Chan, when he was filming Shanghai Knights. Greg is using his education to usher the business into a new era. The store has a new website, and Greg is looking towards the global market that the site and e-commerce will provide him. Because many of his clients are agriculturally-based, they often can’t drop their work in order to travel to the store. The website provides them with the ability to order their custom-designed silver works from the comfort of their home. New technology even allows them to transfer designs to the computer, and create 3-D imaging of the work. For example, Olson’s was creating a buckle for the Calgary Stampede chuckwagon canvas auction. The design incorporates Calgary’s skyline 3-D etched into the background. Butch is doing the hand-craftsmanship now. Greg says that he can see two distinctly different lines emerging in Olson Silver?—?the production line, and the handmade custom buckles, with engraving and overlays with initials, brands, stones, rope edging and more at the request of the client. “I put in a lot of hours, but it balances out. It’s a great way to balance family,” says Greg, allowing him the flexibility to work the hours needed at the store, and also gives him the opportunity to travel to hockey games with his 12-year-old son, Brayden. Greg is involved in coaching and hockey training, and hopes for the days when he might have time to start team roping like Butch. Brayden is now also looking with interest at the silver shop, wanting to try his hand at the family craft, bringing possibilities for Olson Silver to continue its legacy through a fourth generation. Sheena (Fleming) Read grew up in the hills west of Nanton, learning to love the land and the history that surrounded her. Custom made for Lara Palmer by the Millarville Ride for Stars, this sterling silver and 10kt gold buckle is completely engraved by hand. Every year Olson Silver donates a buckle to their auction to help raise money. “I especially like the engraving on the logo,” adds Greg. Photo courtesy Olson Silver Company. 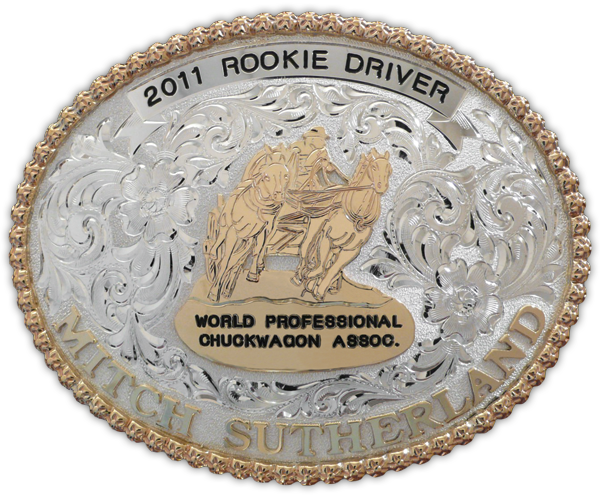 The WPCA is a long-standing client of Olson Silver; the 2011 Rookie Driver award buckle presented to Mitch Sutherland. Photo courtesy Olson Silver Company. 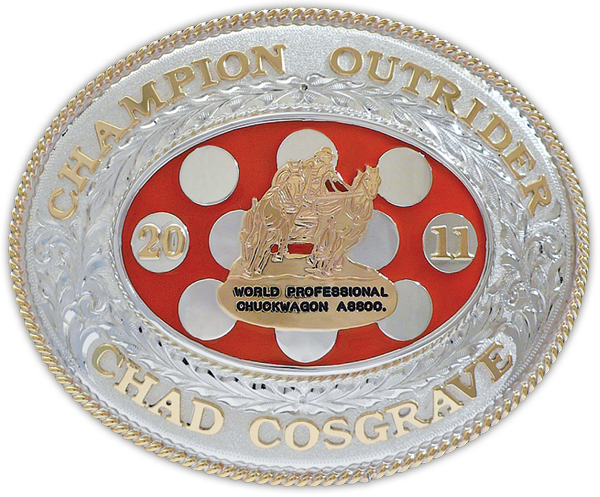 2011 World Professional Chuckwagon Association’s Champion Outrider buckle, presented to Chad Cosgrave. Photo courtesy Olson Silver Company. Buckles aren’t just for cowboys. 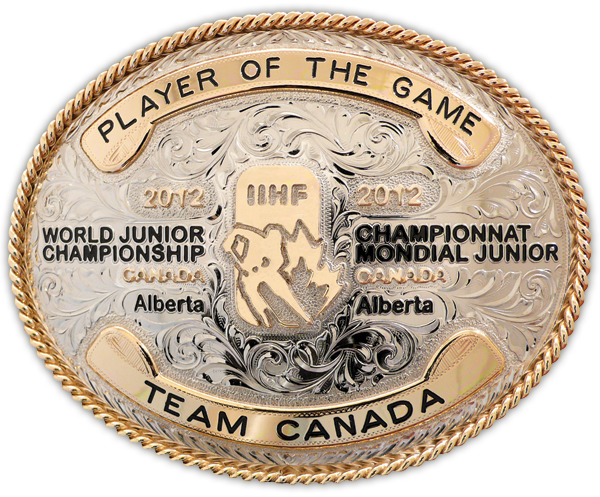 Olson created this beauty for Team Canada for the Player of the Game of the 2012 World Junior Championship. Photo courtesy Olson Silver Company. 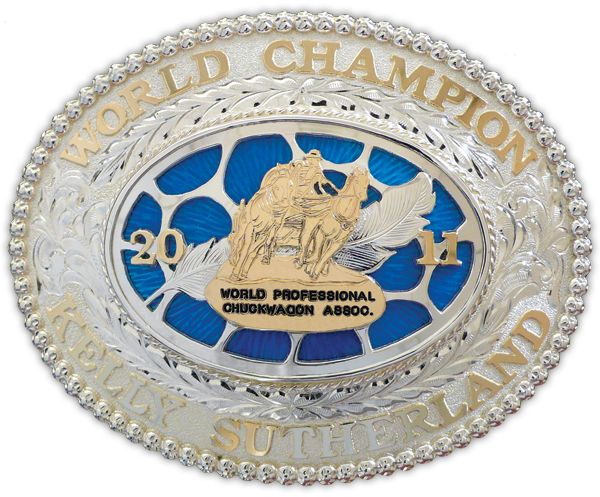 Sterling silver and gold 2011 World Champion buckle presented to Kelly Sutherland. Photo courtesy Olson Silver Company. The Daines Ranch Pro Rodeo (Innisfail, Alta.) 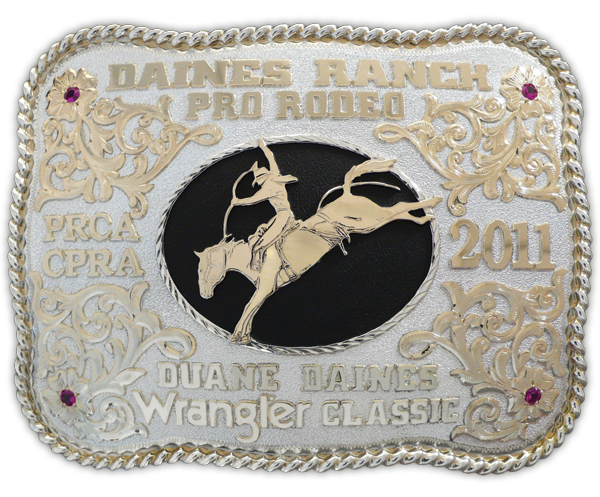 buckle features the custom silhouette of Canadian Champion saddle bronc rider Duane Daines on Calgary Stampede’s Moon Rocket. Photo courtesy Olson Silver Company. While buckles are the “backbone” of the business, Olson Silver also creates additional works for clients, including this silver filagreed sterling buckle set. Photo courtesy Olson Silver Company.